Beamz USB Laser Music System Has Cowbell | OhGizmo! The notes are timed to the beat of the rhythm accompaniment and that as you trigger each one, an appropriate musical sequence of notes is played depending upon the rhythm accompaniment’s current key. In short, you’re performing much like a music conductor: you’re calling upon each instrument and controlling the shape of the music, but the beamz software is taking care of making sure everything fits together seamlessly. I just have two questions: does it have bagpipes, and can I get more cowbell with that? The Beamz Music Performance System will be available from Sharper Image for about $600 (!). 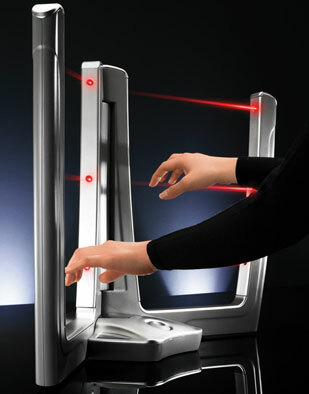 Saw your earlier post about the beamz – that fascinating new music laser product. Check out the beamz in action on this brand new You Tube video. The product will be available in Sharper Image stores in 2 weeks.